You are here: Home » Blog » Housing » Mortgage » How Much Has Inflation Affected Mortgage Rates in the Last 5 Years? In some ways, mortgage rates are a reflection of the overall health of the American economy. 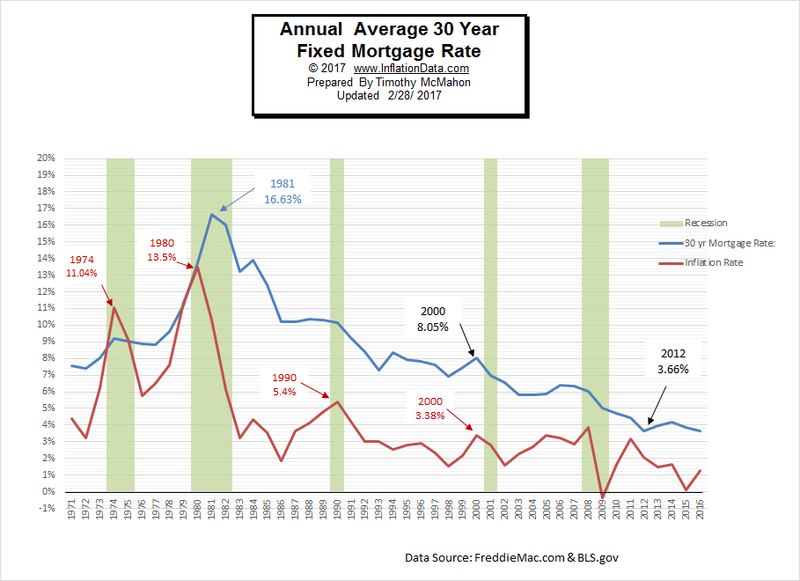 As we can see in the chart below from “FreddieMac“, often both mortgage rates and inflation rates peak during recessions and tend to fall or are stable during better times. How has inflation impacted mortgage rates recently? As we can see from the following chart the Federal Reserve lowered the Federal Funds rate during the “Great Recession” to near zero for the first time. It kept it low until October 2015 when it began to very slowly increase it. In January 2016 it was up to 0.34% (still extremely low by historical standards), by September 2016 it was 0.40% and by January it was 0.65%. So although this may look like a massive increase the previous lows were 0.93% in 1958, 2.92% in 1992, and 1% in March 2004. With rates still below historical lows many economists believe that the FED is “out of ammunition” should another crash occur. The Federal Reserve increased interest rates from 0 percent to .75 percent (with an effective rate of 0.65%) over the last year. In theory, that should have sent mortgage rates higher. However, they are still hovering around 4 percent just like they have been for the past five years. Generally, an increase in rates signals that inflation is growing, but mortgage rates haven’t increased yet. As rates fall people find it profitable to refinance their mortgages to get lower rates and either lower their monthly payments and/or shorten the term of their loan. Because mortgage rates will probably start rising soon, mortgage companies like Assurance Financial Group recommend that people with adjustable rate mortgages consider locking in current rates and getting fixed rate loans.